Living behind the curve: can a 150 quid laptop be any good? I’ve been neglecting the blog for a bit. There’s a couple of reasons for that, but I do have some more hefty posts coming up soon. In the meantime, I thought I would start what might be a continuing series on my recent acquisition of a cheap laptop, and whether it can be made to work despite my worst misgivings! I suppose I should start with where I’m coming from as a consumer. Like many people my age (53 at the date of this post) I’m not a natural with the ever-evolving world of technology, but nor am I a complete technophobe. I’m basically interested in what tech can do for me (non-complex word-processing, music recording and editing, and communicating with the great wide world through t’internet, mainly) rather than in the tech itself. I have an ageing desktop at home which acts as my recording studio and principal home work station; I have a mobile phone which, theoretically, could be semi-smart, but I use solely for phoning, texting, and listening to music on. In between those things, I’ve been looking for a device that’s (reasonably) portable, gives access to the internet, and is simple to use. It will fulfil two main functions: allowing me to spend less time in the upstairs study/recording studio and more with the rest of the family downstairs (while they stare at a tv screen, I can stare at a different screen and be some sort of presence in their lives, I reason) and for holiday use, to load photos on/connect to dubious hotel wi-fi and check on Facebook/Twitter/all that sort of stuff. I appreciate this may sound like the Dark Ages to some of you. The truth is though, I rarely find the need to check my social media status on the move; it can wait till I get to my next cup of coffee, at least. And yes, I have heard of tablets, thanks – I tried one of those, an Asus, and it fell over within a year. All of which is by way of explaining why my purchasing decisions generally show me resolutely behind the curve, tech-wise. I tend to think that they should have just about mastered laptops by now: I’m perfectly happy with a proper keyboard firmly attached to the screen. Also, having dabbled with Android, and free-to-download word-processing ware before, I’m not that fussed. I’d rather stick to the tried and tested Microsoft stuff, however expensive and less than perfect it might be. So, having alienated all the techies in my readership already, what was I looking for, and where? Well, the where round these parts is easy: there are only two shops in twenty miles of my home that actually sell computers now, and they’re both in the same retail park: Currys, and PC World. Even more conveniently, they’re owned by the same people, but in one of those entertaining glitches in the all-encompassing world of global capitalism, they sell a slightly different set of laptops. So it’s worth trekking the few yards between the two, past Toys R Us, Next, and all the other exciting-yet-depressingly-ubiquitous brand names you get in every single retail park in the UK, just to see if the other one’s got something different. I’m sure that’s been carefully thought through by their owners. Isn’t she lovely? 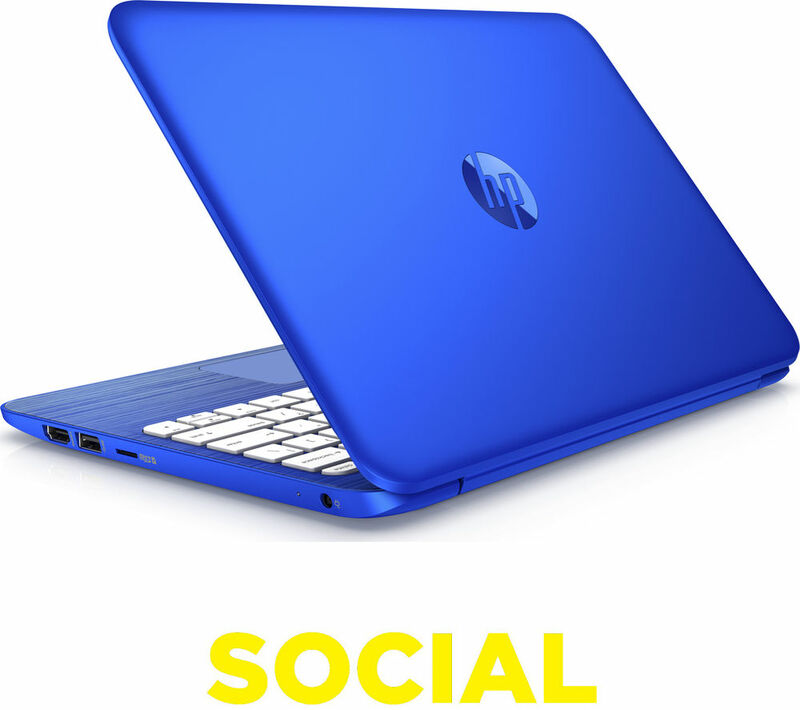 OK, so she’s just an HP laptop (technically an HP 11-R050SA), but once I saw her, I couldn’t take my eyes off her. It wasn’t just that she was petite (11.6″) and cheap (£149.99), the way I like my laptops: she was – hot damn it, she was pretty in that colour! The sales assistant warned me she was slow. That was okay: I wasn’t going to do anything beyond basic wordprocessing, maybe the occasional powerpoint for work, and browsing the Web, on her. That seemed to be the main difference between her and the other, much more expensive types, sitting sulkily in rows around her. Then began the Battle of the Add-Ons. Now, this is normally where I revert to national stereotype, and become incredibly mean about everything; whether it’s being Scottish, or just a bleeding heart liberal’s in-built mistrust of big business, I generally take the narrow-eyed stance that everything they try to sell you after the thing you came in for is to be treated with extreme suspicion. So I usually pass on the extended warranty, the anti-virus software (I’ve pretty much survived on the free version of AVG for years, without any major incident) and, occasionally, even the Microsoft Office (didn’t that used to come as standard? Oh, yes, sir, but now we like to give you the choice). So, just to sum up there, the laptop cost 20 quid less than the sum of the protection money to insure it doesn’t fall over in the first three years, and non-techy software to run on it for basic office functions. Steal of the century or pig in a poke? Stand by for updates. WordPress may have put adverts below here. It’s in the terms and conditions somewhere.